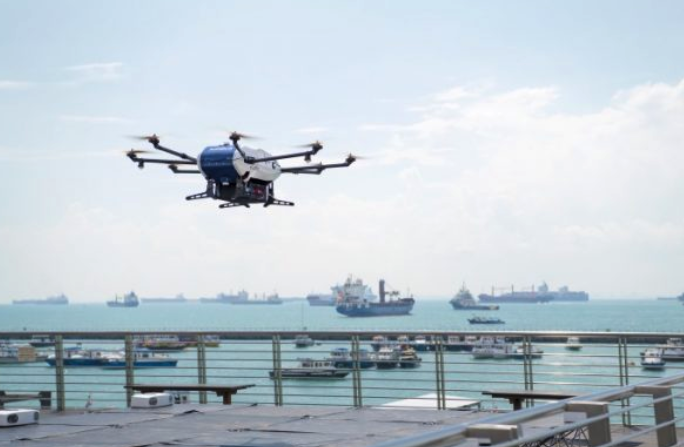 Wilhelmsen and Airbus are conducting the world's first commercial shore-to-ship drone delivery trial, according to Hellenic Shipping News. 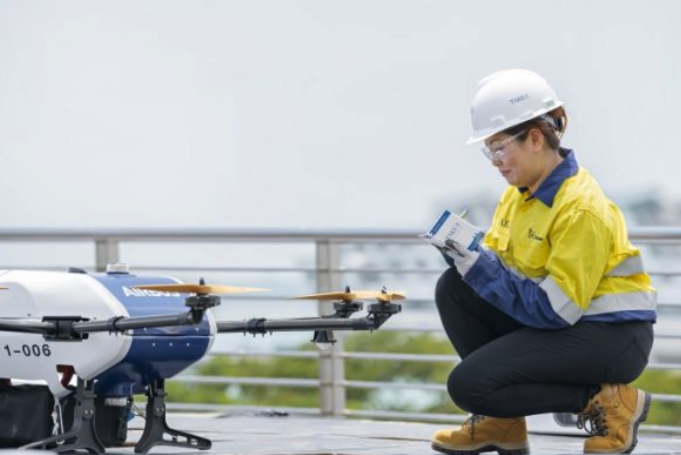 The team is testing its "Skyways" drone delivery system in Singapore, which marked the start of its commercial trial operations. The first test allowed the Airbus-built drone to lift off from the Marina South Pier and fly almost 1 mile to Eastern Working Anchorage. 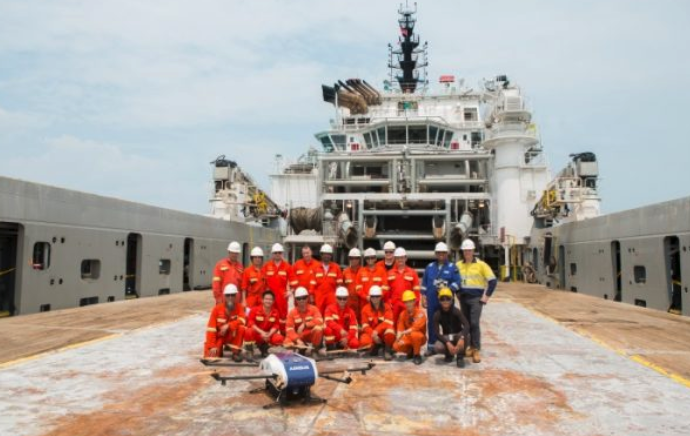 The drone then landed on the deck of the Swire Pacific Offshore (SPO)’s Anchor Handling Tug Supply (AHTS) vessel and discharged its 3 lbs. cargo before returning to its base. Wilhelmsen believes that "Skyways" offers a more cost-effective, speedier and safer means of delivering small high-priority items to vessels moored outside the port. “Delivery of essential spares, medical supplies and cash to master via launch boat, is an established part of our portfolio of husbandry services, which we provide day in and day out, in ports all over the world. 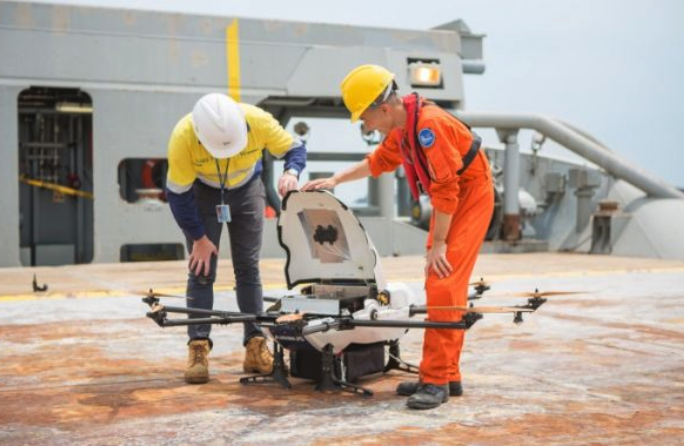 Modern technology such as Unmanned Aircraft Systems (UAS), is just a new tool, albeit a very cool one, with which we can push our industry ever forward and improve how we serve our customers," said Marius Johansen, VP Commercial for Wilhelmsen Ships Agency. The project is a joint effort between Airbus, Wilhelmsen and the Singapore government. Wilhelmsen was tasked with setting up the logistics for the drone to operate in controlled airspace. 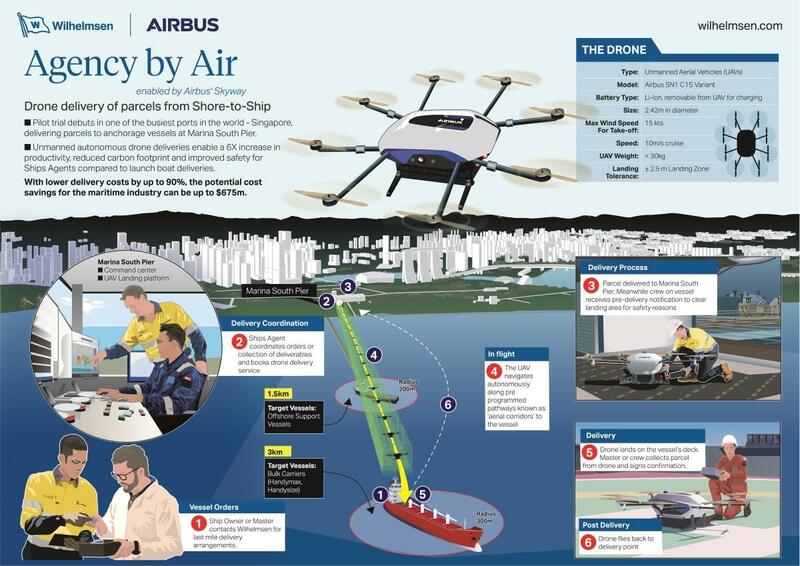 Airbus provided the expertise in drones to develop the aircraft for shore-to-ship deliveries. "We are thrilled to launch the first trial of its kind in the maritime world. Today’s accomplishment is a culmination of months of intense preparation by our dedicated team, and the strong collaboration with our partner, as we pursue new terrain in the maritime industry," says Leo Jeoh, Airbus Skyways Lead. The ongoing trial will focus on offshore supply vessels moored about 1 mile from the pier. The next trial is slated for the coming months, will focus on a flight range of about 2 miles from shore.